You’ll love the live music and the extraordinary variety of designer-themed bars and restaurants with many gourmet choices to explore, from authentic Mediterranean specialties to spicy Tex-Mex. Complete the night with a world-class show in The Strand Theater. There’s also a vast array of sports facilities including four swimming pools, a jogging track, squash court and ultramodern gym. A shore excursion on your MSC Emirates and Oman cruise can be the opportunity to discover Bur Dubai, at the heart of the metropolis of Dubai, on the south side of the breezy Creek. It’s the oldest part of Dubai and it offers a fascinating insight into the city’s traditional roots. This is where you’ll find many of the place’s most interesting Arabian heritage houses, clustered in the beautiful old Iranian quarter of Bastakiya and the waterfront Shindagha district, as well as the excellent Dubai Museum and the atmospheric Textile Souk. The cruise also offers excursions to the bustling district of Deira: the centre of Dubai’s traditional commercial activity, much of it still conducted in the area’s vibrant array of old-fashioned souks, including the famous gold and spice markets. A few kilometres south of the old city centre, modern Dubai begins in spectacular style with Sheikh Zayed Road, home to a neck-cricking array of skyscrapers including the glittering Emirates Towers. Even these, however, are outshone by the massive Downtown Dubai development at the southern end of the strip, centred on the stupendous new Burj Khalifa, the world’s tallest building, flanked by further record-breaking attractions including the gargantuan Dubai Mall and spectacular Dubai Fountain. West of the Sheikh Zayed Road, the sprawling beachside suburb of Jumeirah is the traditional address-of-choice for Dubai’s European expats, its endless swathes of walled villas dotted with half a dozen shopping malls and a smattering of low-key sights. At the southern end of Jumeirah, there are more iconic sights in the sleepy suburb of Umm Suqeim, including the wave-shaped Jumeirah Beach Hotel, the extraordinary mock-Arabian Madinat Jumeirah complex and the unforgettable Burj al Arab hotel. 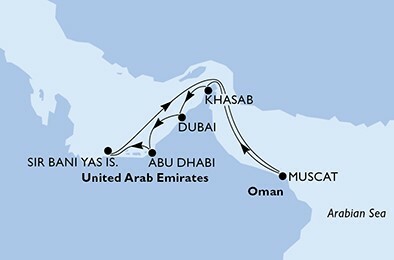 An enchanting stop on this MSC Cruise to Dubai, Abu Dhabi & India is Sir Bani Yas island. It has nothing to do with the hyper-technological progress which you will admire on your trip to the capital, Abu Dhabi. Day at leisure, relax and enjoy the facilities available in the ship or choose for optional on shore excursions. Gratuity/Service charges and other services not stated above. Price is starting from, per person, sharing a double/twin cabin and subject to availability.